When Quesadillas are mentioned, it’s hard not to think of Juicy Meat cooked just right and oozing cheese inside a flour or Corn Tortilla that’s been freshly made the same day. This Mexican dish uses only the best Beef and Oaxaca Cheese (local cheese from Mexico) and is often sold as a street food or served by tight-knit Mexican families as an everyday fare. The dish has gained popularity all over the world with different versions sprouting everywhere. This Beef Quesadillas Recipe is as Mexican as you can get with only the Oaxaca cheese has been substituted with white Cheddar. 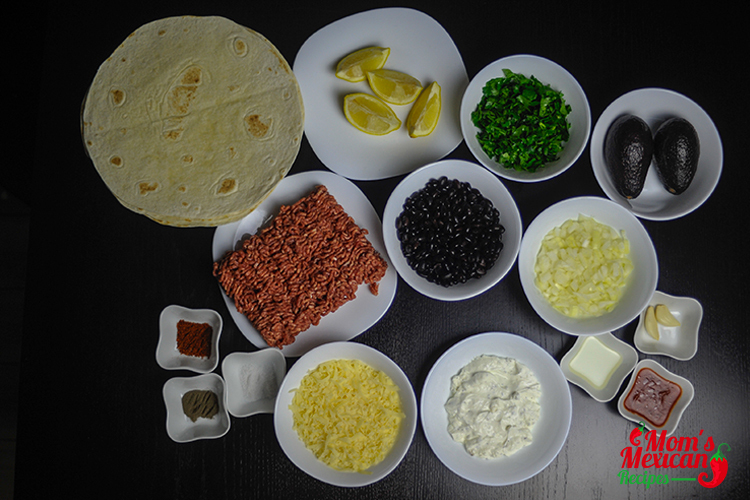 There are many kinds of Tortillas Mexican cooks use to prepare their Quesadillas. 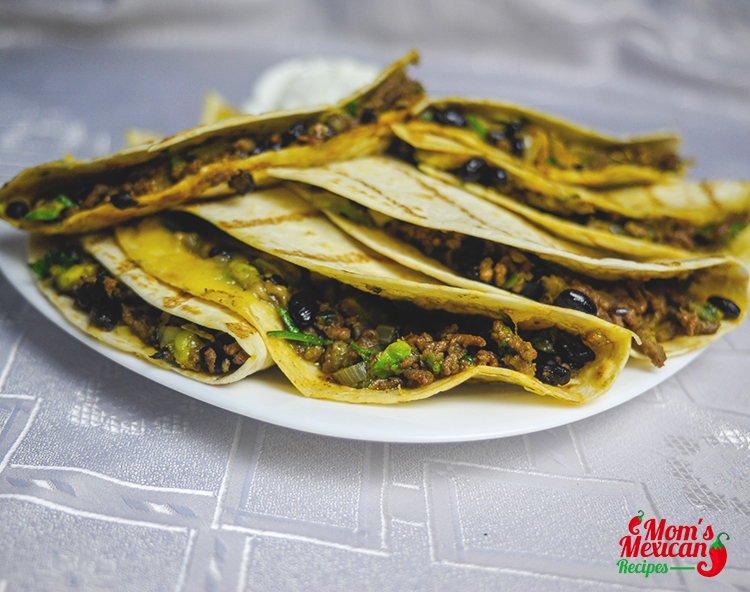 The most common are Flour Tortillas which are what you’re going to need to prepare this Beef Quesadillas Recipe. There are common flour tortillas as well as wheat flour tortillas which are considered to be a healthier choice than regular flour tortillas. There are also types of corn tortillas like blue corn tortillas, white corn tortillas and yellow corn tortillas which have lower calories than regular flour tortillas. Nowadays other variations of Tortillas can also be found like spinach tortillas but the base of the recipe is still the regular flour. 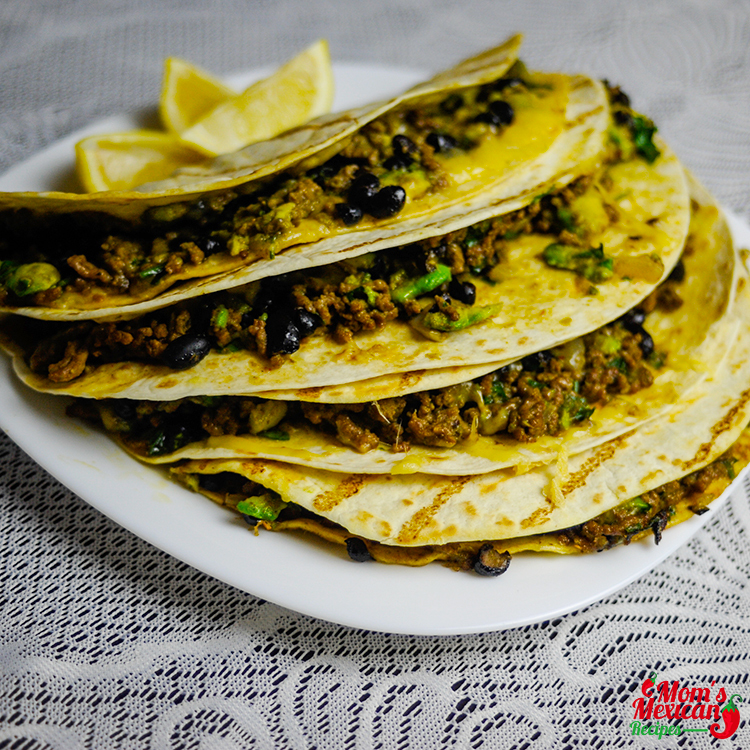 Now when it comes to using beef for this Beef Quesadillas Recipe, there are different kinds of beef to choose from. You could choose regular Ground Beef if you’re not picky but you could also choose Organic beef or Grass-fed Beef if you’re feeling fancy or you’d like to think of yourself as a health buff. There isn’t any difference in the taste actually except that organic or grass-fed beef has a cleaner taste and it’s literally hormone and chemical free so you can be sure that what you’re feeding you and your family is a quality kind of meat which brings no disease to you as you eat them. As said above, typically Mexicans use their beloved Oaxaca cheese to make their Beef Quesadillas Recipe but since this local dish has reached the far ends of the earth people naturally have their own picks when it comes to the cheese they’re using. In this case, White Cheddar will be used. Cheddar Cheese is a kind of hard cheese; sometimes orange, yellow or white. The recipe calls for a White Cheddar cheese which uses no food coloring like Annatto. It has a sharp taste that goes perfectly with Beef and Tortillas. It also melts perfectly so you’ll have gooey Quesadillas. 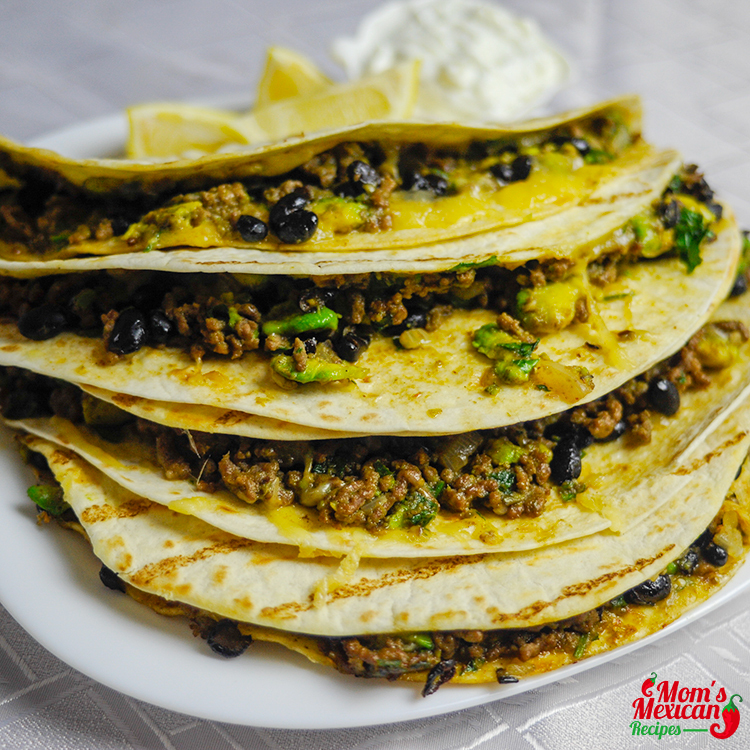 When making this Beef Quesadillas Recipe, don’t forget that there are also other ingredients that finish off the dish and contribute to making it a rockstar at the dining table. Black Beans and Avocados are used to fill up the dish while Tomato paste, Garlic, and an onion add flavor; black pepper, salt, and Taco seasoning spice it up and Cilantro (a favorite herb of Mexicans) is used as a garnish. Lime wedges are put on the side for a bit of tang and sour cream is also served because it goes really well with all the combination of flavors. Now that you’ve got a great lunch or dinner meal, all that’s left to prepare is a pitcher of ice cold beer and fruit juices for the kids and you’re all set. In a pan, add 2 tablespoons oil. Add beef, breaking up with a wooden spoon, season with salt and pepper, sauté with garlic and onion until softened about 3 to 4 minutes on medium heat. 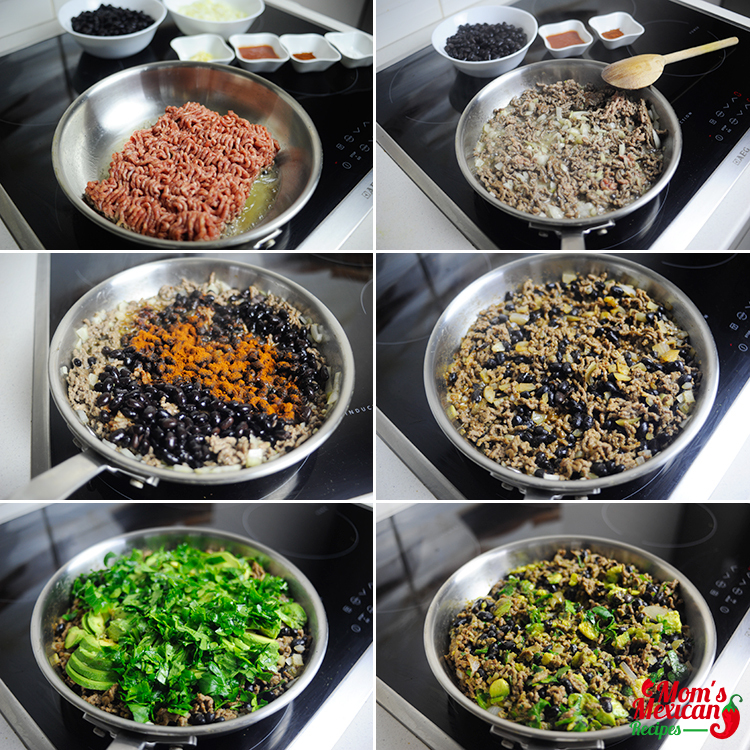 Add taco seasoning, tomato paste, 1 tbsp water and black beans; cook on medium-low for 5 minutes. Turn off heat and mix in avocado and cilantro. Preheat another a large non-stick pan over medium heat with 2 teaspoon oil. 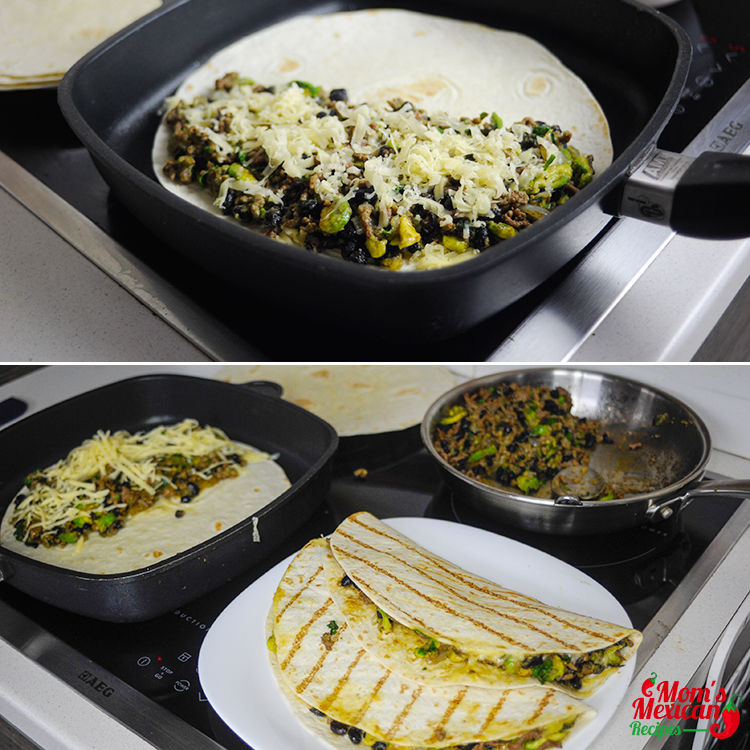 Place a tortilla in the pan and sprinkle half with cheese, beef mixture. Fold tortilla over and fry lightly on both sides until cheese is melted. Repeat with remaining tortillas. Cut quesadillas half and serve with lime wedges and sour cream. Enjoy! 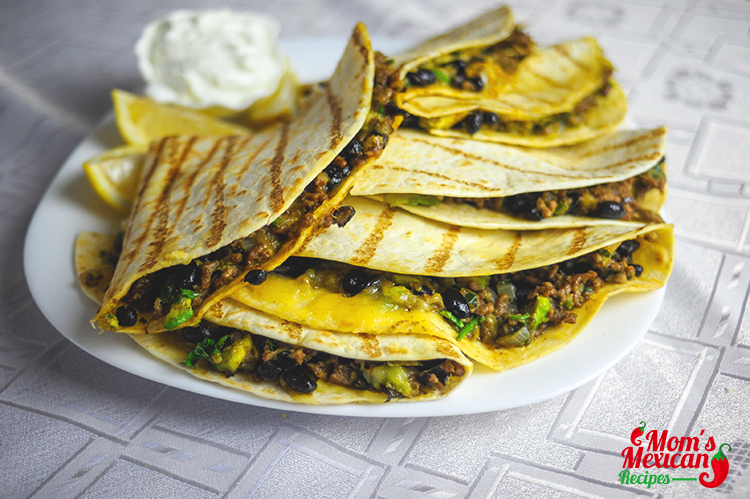 These quesadillas look great- I like the combo of the beef and beans. I’ll be in SoCal soon, so I can access the Oaxaca cheese!